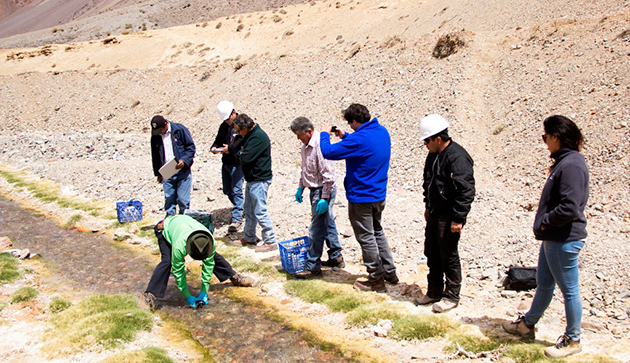 A group of community representatives from El Corral, Chile were recently invited to participate in Barrick Gold’s community water monitoring program, part of the company’s on-going efforts to promote transparency at the Pascua-Lama project. The community members took samples from different monitoring points along El Carmen River and then delivered the samples themselves to an independent, accredited laboratory in Santiago for testing. The Atacama region, where Barrick’s Pascua-Lama project is located, receives very little annual precipitation, making water-related issues a top concern for local communities. Although construction at the project has been temporarily suspended, the company must continue to monitor water quality to fulfill its environmental permit commitments. Inviting community members to participate in water monitoring activities is part of the company’s on-going efforts to address their most pressing concerns.